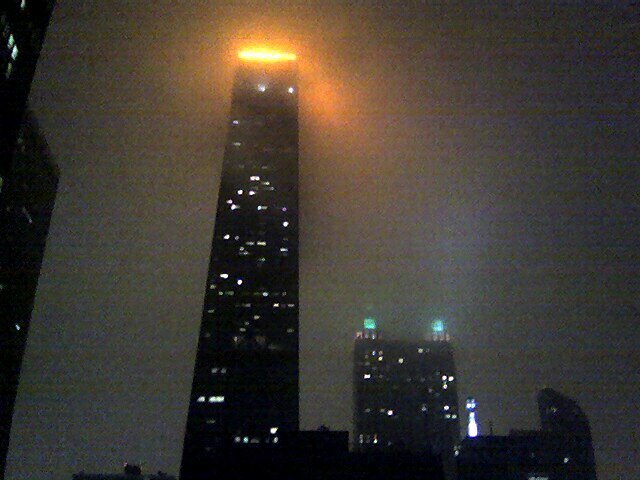 The John Hancock gets high marks for the navy blue, orange and white about 100 stories in the sky. C’mon Indianapolis, let’s see you top that! The Wrigley looks regal (left.) Tribune Tower isn’t in the game. Here, you see it better up close. And that’s Donald Trump’s new Tower encroaching on the left. One South Dearborn looks jazzy beaming out over Michigan Avenue. look snazzy, rootin’ for da Bears. 211 Wacker does a lot with just a few colored lightbulbs. or two. The Merchandise Mart. And then – our lions. Guarding our cultural treasures inside the Art Institute. They were due to have Bears helmets slapped on them today. (Why? To show that museums are not stuffy places? What do winning sports teams have to do with the preservation of and contemplation of sublimity in a museum?) But the helmets were too small and in the very cold weather they’d have cracked if they’d been forced on. So the lions – and the Art Institute – keep their dignity for one more day. C’mon Indianapolis ?! Beat that. da town’s agog for the Super Bowl and da Bears. A new Chicago Spire is due to be unveiled to the public this Monday – it’ll taper more at the top because people here rejected Calatrava II up on the left. We didn’t like the flat-top haircut he’d given his original design, in order to get more usable space up there. The new Calatrava will again taper. All this got me to reconsider the John Hancock as I see it out my window. I wondered if the Hancock could be nicer if it tapered more at the top too. It’s flat top of course is a product of the Modernist times. I like how it’s the horizontal of the prairie, and anyway there are not one but two antennas on top, to continue and resolve the upward thrust. But the comparison won’t go away. Calatrava knows where he’s building and what our legacy is. So though he’s an out-of-towner, from Spain, then Zurich, how will his tower fit in with the great locally designed works? If his “Chicago Spire” finds the financing to get built here, in the long run will it be more pleasing to the eye than the “iconic” John Hancock tower? The dancer vs. the muscleman. Throw down the gauntlet, from the 95th floor. It certainly could end up prettier, with its fair skin and eternally swirling upward dance, from feet, nimbly on the ground – Calatrava III will lose the parking at ground level and meet the street in more humanist manner; up to her peak on which Calatrava III adds a bright searchlight on top shooting straight up. Big John is a more monolithic unmoving presence. He always was a bit awkward at ground level. And he shows off a little too much – his x braces like abs. His mood and the energy he gives off is dependent on and altered mostly by the shifting mist or fog at his very top, around the bright white (church or lighthouse-like) lantern on top, so odd for being horizontal up there, but intriguing and satisfying in a Midwestern way for it. And the bright light on top works well to remind you of how high in the sky he his. The Hancock’s tapering slope up to heaven feels right, and I’ll always admire its simple straightforward honesty. I post this mainly to direct you here. A post that might have gotten lost. Back to the photo above – of the John Hancock (SOM), 900 N. Michigan (KPF), and the beacon of the Palmolive Building (Holabird & Root). What a good-looking city! The Hancock is good. 900 North is, eh…. Palmolive is great. Interesting too how, from Lake Shore Drive, the Drake Hotel in front of the Palmolive Building seems like a part of it; it seems like the base from which the Palmolive rises. Many of you have written in to ask if the John Hancock, is really our stadtkrone, our city crown, as I said it was a couple of days ago. Some asked, wouldn’t it be more appropriate for a church to be our crowning glory? As in for example this photo that just happened to be in this week’s New York Times. Big John towers over even our churches and palaces. Here, St. James Cathedral and the newly-cleaned Nickerson Mansion. Now, since I first posted on the flat white line atop the Hancock, I’ve become, shall we say, obsessed with it. A la Robert Delaunay and the Eiffel Tower. 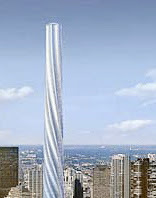 If it goes up, would you consider the Calatrava our neuvo stadtkrone? What’s a “Dear John” letter? Click here. You are currently browsing the archives for the Hancock category.